The holidays are a stressful time for a lot of people and for a variety of reasons. Finances are a big part of the problem because the season has become so commercial. We have so much to give that mean so much more, it begs to have a reminder of the gifts from the heart that don't come with a monetary cost. 1. The gift of time and attention: What can be better than the gift of your time? We each have the same 24 hours in the day, but with our hectic lifestyles time often gets away from us. That’s why giving someone your complete attention is a rare gift. While you are with someone, don’t text or check your email under the table. Be present with them. Remember that most people just want to be understood and feel valued. The mere feeling that you are being heard can be very healing to someone. Paying attention is a precious gift you can give anyone and is the lasting memories that will be cherished when those people are no longer with us. 2. The gift of listening: Most people think that listening benefits the person who is speaking, but it also benefits the listener. It gives you time to really understand what someone is telling you, and maybe discover something you never knew about them. We have two ears and one mouth for a reason! It takes the pressure off you, because you don’t have to worry about jumping in with your own stories or witty remarks. Really listening means you withhold judgment or advice unless you are asked. Don't spend your listening time just thinking about what you want to say next! 3. The gift of sharing joy: Take a few minutes to share a funny story or joke you heard, a tasty organic recipe, a lesson learned, or a hope or dream for the New Year. Lend your friend a book that delighted you, some music that moved you, a link to a hilarious cat video on the internet, or a movie that made you laugh out loud. Sharing something that amused or delighted you will lighten your moods and your hearts. 4. 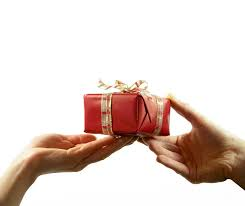 The gift of help: Most people need help of some kind, and often the simplest things can make a big difference. People with young children always appreciate the gift of babysitting. People who have difficulty moving around will be most grateful for help with simple household chores, such as offering to change burned-out light bulbs or picking up groceries on bad-weather days. Be a snow angel for your neighbor and shovel their sidewalks if you are healthy enough and live where it snows! 5. The gift of information. If you’ve been reading this blog, you’ve discovered many new ways of . You’ve learned about keeping healthy and strong and much more. Why not pass this information along to your friends so they can also share in the weight management and health strategies discussed here? Not everyone has the time or ability to research new ways to keep healthy and active. You are one of the lucky ones who does. Sharing the information you learn can launch other people on their journey to health. 6. The gift of humor: Laughter draws people together. If you stop to think about it, how many times a day do you laugh? Probably not as often as you did when you were a child. There is even laughter yoga classes to reduce stress! In this holiday season, take a few moments to laugh with your family, friends and people you work with. A dose of humor stimulates your endorphins, so it actually makes you healthier. But the main reason to share a chuckle is that laughing just feels good, and spreads warmth and cheer. Don't be afraid to laugh out loud - joy is contagious! 7. The gift of thanks: Too often, we don’t take the time to thank people or tell them that we appreciate them. It’s never too late to take a moment out of your busy day to give sincere thanks to people who helped you this year. Send a hand-written card, an email, or an e-card. Better yet, pick up the phone and say “Thank you.” Best of all, visit in person and deliver a big hug. Your kind words, warm touch and expression of sincere appreciation can make all the difference in someone’s day. And now I’d like to thank you for giving me a few moments of your precious time. I feel honored and privileged to have spent this past year with you. I wish you joy and health through the holiday season and look forward to being part of your journey in 2015. 1. Create a Game Plan: Get organized and start checking off that check list. Getting items before the day of your event or celebration also helps prevent stress caused by time constraints. 2. Make a Budget: Finances are always stressful. Make a budget and stick to it. Don't overspend and put yourself in a bad place. A thoughtful gift doesn't have to be expensive. Be creative! 3. Accept Reality: Mistakes are going to happen and drive you crazy. Try to go with the flow and accept that life and everyone in it aren't perfect. 4. Create New Traditions: Try to switch things up each holiday season. Sometimes doing the same thing over and over again for years can drain out a certain person or a group of people. Take a vacation every other year, or do a gag gift exchange instead of stressing over getting thoughtful gifts for loved ones. 5. Stay Healthy: Everyone has a busy schedule, but don't neglect your health. Exercise and diet play a huge role in how you are feeling. Exercise is also a great stress reliever! 6. Lower Your Alcohol and Caffeine Intake: Try to drink less caffeine and alcohol. Caffeine can disrupt your sleep schedule and alcohol can make you feel sluggish and depressed. 7. Take a Break: If you are feeling overwhelmed take a minute to pull yourself together. Stop for a couple minutes and do breathing exercises or find a quiet place and listen to some of your favorite music. Talking a short walk outside can also help ground you.